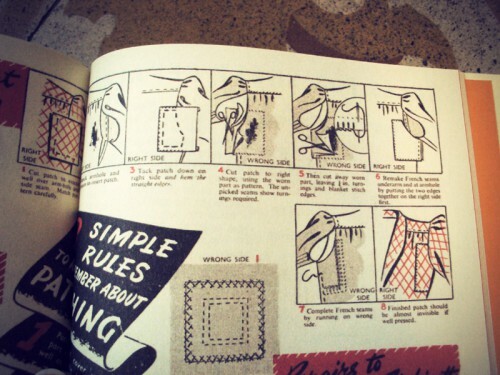 In Sarai’s previous post she very sweetly expressed that she enjoys vintage sewing books because ‘They give a glimpse back into the daily lives and skills of everyday women’. 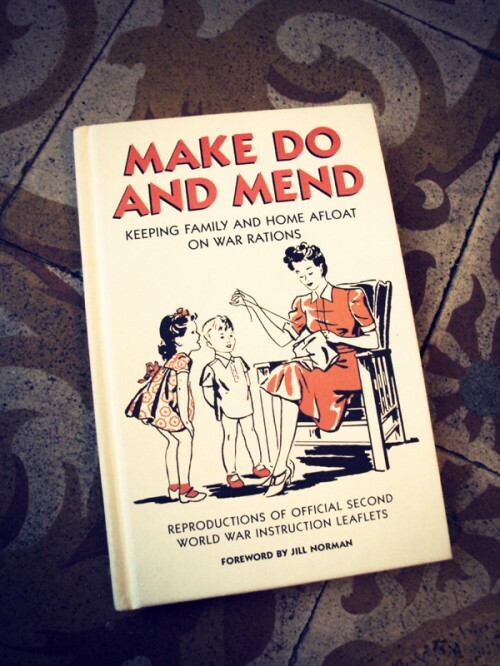 Recently I have been reading a book on Make Do and Mend, the skills and techniques employed by women in the UK during the Second World War to cope with the hardships that were enforced upon them, and have subsequently found myself struck by a similar feeling. The book actually is comprised of reproductions of official instruction leaflets issued by the British Government but also has a well written foreword which puts these leaflets into the context of the times with some fascinating information. The privations women experienced in regards to resources begun as soon as the war started in September 1939 when petrol was rationed. 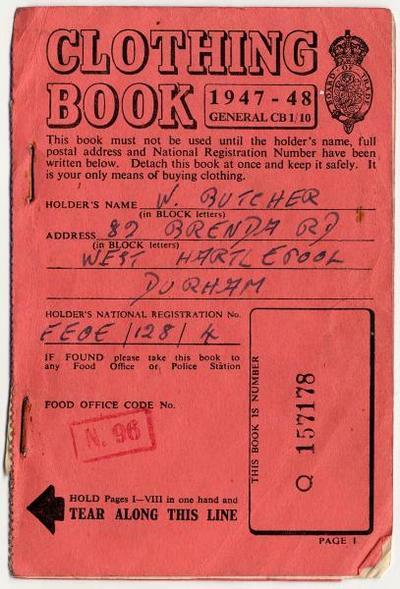 The rationing system consisted of household ration books which contained coupons that had to be presented at the time of purchase. Before long, the restrictions began to encompass almost every item that pre-war could have been purchased with ease, including food, domestic fuel, clothing, fabric, cooking wares, footwear, furniture, soap, pens, and many, many others, and the rationing of some things continued long after the end of the war right up until 1953, in the lifetime of my own parents. These allowances took into account the circumstances of each family, including number of children and even what part of the country you lived in (Northern British dwelling families required more fuel). What’s more, rationing not only grew to encompass more and more products, but also became increasingly stricter with the number of coupons issued becoming less and less, or stopping all together. For example, the meagre amounts of petrol allowed for private cars and motorbikes stopped completely in 1942 unless your car use was essential for the war effort. The rationing of clothing, fabric and knitting wool begun in June 1941, continuing until 1949. Every man, woman and child were issued coupons books. Initially each person was issued with sixty six coupons a year, but this eventually dropped to just twenty. With a woolen dress requiring eleven coupons, you can imagine how important preserving existing garments became. In response to this, the Government distributed more and more leaflets to offer women advice, tips and tutorials. These included topics such as how to avoid moths attacking your clothes, darning techniques for socks and knitwear, reinforcing areas of garments that suffer the most wear and making childrens’ clothes from adult cast-offs. It is amazing to think that these concerns were an everyday reality for my grandmothers and their mothers. How society has altered so drastically from such scarcity that we tend to associate only with developing nations today, to finding our high streets and wardrobes awash with an abundance of cheap ‘disposable’ garments. But arguably parallels can be drawn between living with the threat of destruction through bombing and invasion in the 1949, to the comparatively safer yet still very real threats to our ecosystem through the climate change largely brought on by destructive industries and irresponsible production. I firmly believe that cutting back on needless and mindless consumption of manufactured goods is as relevant, essential even, today as it has ever been. Except, until our Governments can get together and agree on and then enforce changes in the causes of emissions, it’s up to everyone to personally take some of the responsibility by making necessary changes to the way we consume. We don’t have coupons or rationing today to force us to do anything, but should we chose to, those of us with sewing skills are at an advantage. I will be looking into Make Do and Mend further, and will feature the most interesting and relevant tips and techniques from the campaign in future posts. I regret not talking to my grandmothers about the inventive things they did to keep themselves and their families clothed and looking as nice as possible, but hopefully by researching and sharing, we can all ensure that what those generations went through and learnt doesn’t get lost with their passing. This is wonderful….my father was an RAF officer (American by way of Canada) stationed in London. He would talk about how things were rationed, and how the English would pull him off the street and invite him in for tea and share their precious resource of sugar—he was so impressed by their generosity when things were in such short supply. I don’t think we can really get our heads around the way “the Greatest Generation” made their way in the world. I read that even Queen Elizabeth remembers very dearly rationing, war coupons and such….in fact I understand the fabric for her wedding dress was subject to rations and coupons. Interesting. A great post about a fascinating period! I look forward to the forthcoming tips and techniques. Extremely relevant parallels too. I feel very lucky that I can sew, and that I was stubborn about choosing to do textiles at school. What I feel sad about is that in my school it was a subject considered an unacademic waste of time. It was the same with Food and Nutrition. Those subjects are ideal for putting across the message for the need for self-sufficiency to children who may not hear that message at home. I’ve worked in secondary schools more recently and attitudes don’t seem to have changed in the last 20 years which is really unfortunate. If I could change one thing in education, it would be elevating the status of subjects that teach practical, creative skills to the same level as traditionally ‘academic’ subjects so children of all intellectual abilities can at least leave school with skills in self-sufficiency. Wow. Got that off my chest. It’s something I feel strongly about. Clare, I completely agree with you. I was lucky enough to have dress making classes for a couple of years at school, but had to teach myself to cook as an adult. Perhaps it is a case of realising the value and high level of skill in traditionally female tasks. Not just for women but for everone who wants to enjoy them. I’ve come to realise that true female strength is not (just) in beating men at their own game but in valuing our own game. On a related note, I enjoyed the new Bond film, but was disappointed to see their idea of female empowerment involved women shooting, driving in car chases etc. I suppose I should be grateful their clothes didn’t fall off…! Oh, wow, I must look for a copy of this book. I love things like that. I’ve been diligent about teaching my own daughters some of these techniques, handed down directly from her, both in deed and in the books she left. I love this! It is sad to see that we take so much for granted in this day and age. I think its such a good thing to find what we can live without and what we can do to live creatively and free from the consumerism of this consuming economy. I too wish I could have talked to my great grandmother about how they did it. My great grandmother had the most impeccable taste and whatever she had was of great worth to her since she didn’t have very much. She always chose wisely, garments, shoes and jewelry and now those things have been passed down to us as family heirlooms. There is a men’s plan too. I read it to my boyfriend and his immediate reaction was “Wow. That’s not a lot.” Can you imagine only being able to buy underwear every other year! Necessity is indeed the mother of invention. these women are my heroes. Hey, you stole my post! Seriously, I was just in the middle of composing a blog post about my fascination with the Home Front and its effect on dress in the UK, and my passion for recreating the fashions of WW2 (in moderation — no re-knitted sweaters or shirttails patched with other shirts!) out of homage to our amazingly resourceful foremothers. You absolutely MUST read How We Lived Then by Norman Longmate, a fascinating, minutely detailed and compulsively readable account of how clothing rationing and other wartime conditions affected the lives of ordinary men and women in the UK. I have a similar book, though it was published by the United States government. I don’t recall the name offhand, but it was some sort of Victory publication. I was struck with all the skills have been lost in just the few generations since it was published. So many techniques that today would be considered advanced were then things that they could assume everyone knew. And I loved the idea of “turning a suit” – cutting a suit apart, turning it all inside out, and then stitching it all back together. I’ve always marvelled at my mother’s and grandmothers’ abilities to mend clothing to extend wear. We do take so much for granted. I remember she noticed I had a hole in the heel of a pair of tights I bought at Walgreens and took the time to darn it for me. Made me realize there was value in a pair of drugstore tights. Thank you for posting this. Hi There, all the way from `Northern Britain`, i.e. Scotland. My mother-in-law was married just after the Second World War ended, when rationing was still ongoing. Her wedding dress was bought with her own, her mother`s and her sister`s ration coupons combined. I remember my mother turning the collars of my father`s shirts when they were nearly threadbare and I`m so glad I`ve inherited her dressmaking and knitting skills – I just wish I had the time to fulfil all the ambitions I have to knit and sew all the day long! Thank you all for such interesting posts. A most excellent post – I heartily agree with everything you have said. It is indeed our collective responsibility – if only more would heed the message. the old vintage poster and book are something like I’ve collected over the years . ( i have too many) …..But I have been Inspried thanks. I will vist your site often. There has been such huge societal change since the war years that a lot of the practices that were adopted then appear totally alien today. It’s an interesting analogy linking the threat to the UK during World War II to the threat the the world through environmental change today. Yes, arguably the environmental threat is caused by “over-consumption”, but how do you make the consumer feel that threat personally? The same way the women who lived during the war years supported their cause. Just look at all the strikes that are happening across Europe at the moment to see how violently opposed to change and “austerity measures” the modern consumer has become. I completely agree. I have decided to start making all of my own clothing, and it is very rewarding and uplifting. I admire the women of the past who were so stylish and inventive, and that is the model I want to emulate. I remember a friend’s mother saying that she would rather make over, or cut down a man’s suit into a woman’s suit than have a pile of fabric and make one from scratch. I couldn’t believe it, but over the years I have come to love remodeling something I find at the thrift store that just has a problem or two, but otherwise looks great It’s FUN!